TMB Recruitment 2017 – Apply Online for Marketing Officer Posts :- Tamilnad Mercantile Bank (TMB) Limited has released latest notification for recruitment of Marketing Officer (Scale – II). Desirous & eligible candidates can apply online from 20/09/20178 to 03/10/2017. Educational Qualification: First Class Arts/Commerce graduates with First Class Post Graduation in Marketing/Finance in regular college course. Starting Date of Online Application : 20/09/2017. Last Date of Online Application : 03/10/2017. Application Procedure : Eligible candidates may apply online from the website http://www.tmb.in from 20/09/2017 to 03/10/2017. 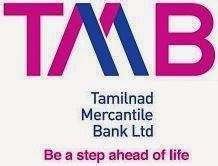 Tamilnad Mercantile Bank (TMB) Limited has published latest notification for recruitment of Clerk posts. Desirous & eligible candidates can apply online from 08/02/2017 to 22/02/2017. Age Limit: 24 years for Graduates and 26 years for Post Graduates as on 31/10/2016. Educational Qualification: A Graduate (Arts, Commerce & Science), other than Engineering category, with minimum of 55% marks from a recognized University in regular college course with knowledge in Computer Operations. [OR] An Engineering Graduate with 60% marks from a recognized University in regular college course with knowledge in Computer Operations. Application Fee: Candidates will have to pay a fee of Rs. 300.00 (Rs. 150.00 for SC / ST Candidates) by way of online mode. Starting Date of Online Application : 08/02/2017. Last Date of Online Application : 22/02/2017. Application Procedure : Eligible candidates may apply online from the website http://www.tmb.in from 08/02/2017 to 22/02/2017. Subscribe our free job alert mail for TMB Recruitment 2017.